I don’t know if it’s just me… but I get very uncomfortable watching ‘American Idol’. The VAST MAJORITY of the show now focuses on the DRAMA between the judges and we’re actually seeing LESS auditions this season. Is American Idol becoming like MTV? No longer about actual music? 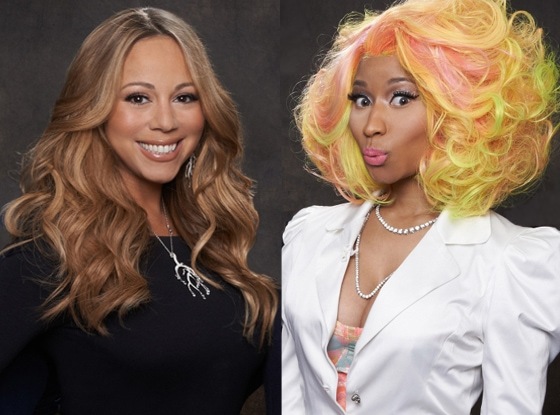 The FIGHTING that happens between Mariah Carey and Nicki Minaj is cr-azy. And it looks like next week is going to be the worst episode yet. There were moments where the person who auditioned and got through to Hollywood couldn’t even celebrate that he/she won because they were so invested in the FIGHT behind the panel. It’s a little sad. Ok, it’s a lot sad. I like watching the backstories of the contestants. I like to get invested in them BEFORE I hear them. It was a heartfelt show at one time… sort of a musical summation of the American Dream. Now it’s about rolling eyes, snarky comments and… British Accents. Someone told me that both Mariah Carey and Nicki Minaj have already said they will not return next year. I can’t 100% guarantee this – just a rumor at this point. Who knows? Maybe they will begin to see eye to eye once they get to Hollywood? What do you think about American Idol this year? Are you loving it? Or are you wishing for the old formula?